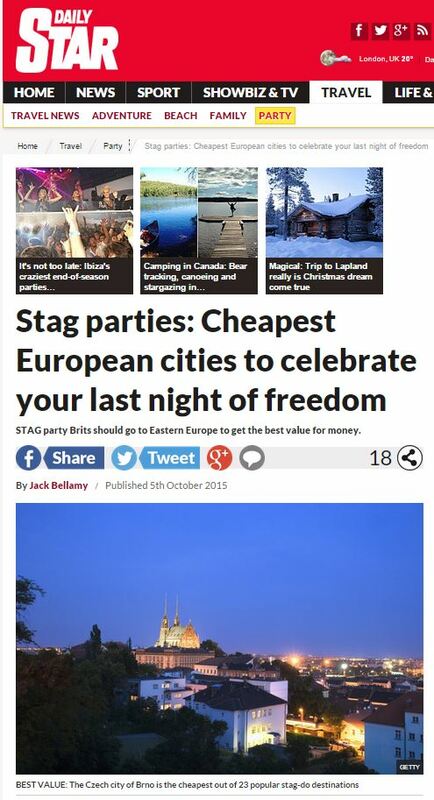 STAG party Brits should go to Eastern Europe to get the best value for money. A survey found the Czech city of Brno is the cheapest of 23 popular stag-do destinations in Europe. An average two-night stay with plenty of Budvar lager thrown in works out at just £281.92. Following closely behind is the Slovakian capital Bratislava, where a weekend break is usually around £283.51. If you’re thinking of going on a stag do soon, you’re in luck: the Daily Star and Mirror recently published important information on where gets you the most bang for your buck. As it were. But is this really news? Or just PR? “Stags and their mates who make it to Eastern Europe and further afield often find that the extra hour or so on the plane makes a big difference, as their accommodation, food and drinks are much cheaper,” said Rasmus Christiansen from Pissup.com. You’ve been around the block by now – I don’t have to tell you who Pissup.com are, what they do or why these articles are nothing but adverts for Pissup.com’s services. This entry was posted in Pissup and tagged daily star, Jack Bellamy, James Andrews, mirror, Pissup, Rasmus Christiansen on October 21, 2015 by Michael Marshall.